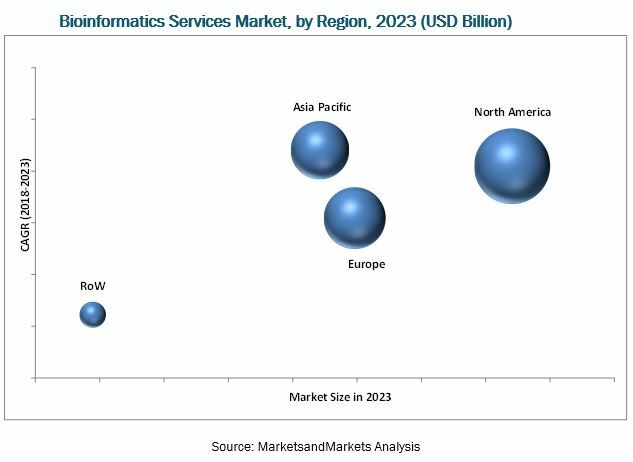 [138 Pages Report] The bioinformatics services market was valued at USD 1.58 Billion in 2017 and is projected to reach USD 3.53 Billion by 2023, at a CAGR of 15.7% during the forecast period. This research study involved the usage of extensive secondary sources, directories, and databases such as D&B, Bloomberg Business, and Factiva, along with government databases, to identify and collect information useful for this technology-based, market-oriented, and commercial study of the bioinformatics services market. In-depth interviews were conducted with various primary respondents, including key industry participants, subject-matter experts (SMEs), C-level executives of key market players, and industry consultants, to obtain and verify critical qualitative and quantitative information as well as to assess future prospects. The secondary sources referred to for this research study include corporate filings (such as annual reports, SEC filings, investor presentations, and financial statements); research journals; press releases; as well as articles published by various bioinformatics service providers and professional associations. As of 2017, Illumina (US), Thermo Fisher Scientific (US), Eurofins Scientific (Luxembourg), BGI (China), NeoGenomics (US), PerkinElmer (US), CD Genomics (US), Macrogen (South Korea), QIAGEN (Germany), GENEWIZ (US), Source BioScience (UK), Microsynth (Switzerland), MedGenome (India), Fios Genomics (UK), and BaseClear (Netherlands) are some of the key players in the global bioinformatics services market. A majority of the leading players in the global market adopt the strategies of developing technologically advanced bioinformatics services, entering into partnerships and collaborations to co-develop improved bioinformatics solutions, and acquisitions to enhance its market position. *Note: Other Sequencing Analysis includes bisulfite sequencing, amplicon sequencing, and microbiome analysis, among others. Other Bioinformatics Services include biological pathways analysis, development of healthcare apps, customized bioinformatics based software development, and high-throughput image analysis, among others. Other Applications include molecular phylogenetics, glycomics, cytomics, physiomics, and interactomics, among others. Other End Users include non-profit organizations, reference laboratories, agrigenomics organizations, and consumer genomics companies, among others.. The global bioinformatics services market is expected to reach USD 3.53 Billion by 2023 from USD 1.70 Billion in 2018, at a CAGR of 15.7% during the forecast period. Factors such as increasing public-private sector funding for bioinformatics services, the shortage of skilled bioinformatics professionals leading to increased outsourcing of bioinformatics projects, and growing applications of bioinformatics in various industries are expected to drive the growth of the global market. The report analyzes the global market by type, specialty, application, end user, and region. On the basis of type, the bioinformatics services market is divided into sequencing services, data analysis services, drug discovery services, differential gene expression analysis, database management services, and other services The sequencing services segment is further classified into whole genome sequencing and de novo assembly, exome analysis, transcriptome analysis, metagenomic analysis, ChIP-Seq analysis, and other sequencing analysis, whereas data analysis services segment is classified into data mining, genomic analysis, proteomic analysis, and variant annotation and discovery. The sequencing services segment is expected to account for the largest share of the bioinformatics services market in 2018, owing it to increasing funding from government as well as private bodies for next-generation sequencing based projects, technological advancements in next-generation sequencing coupled with decreasing sequencing costs, and the need of high-throughput analysis of a large amount of data generated during sequencing. Based on end user, the bioinformatics services market is segmented into academic institutes and research centers, hospitals and clinics, pharmaceutical and biotechnology companies, and other end users. Among these, the academic institutes and research centers segment is expected to account for the largest share of the global market in 2018, owing it to the rising number of bioinformatics-based research studies, rising number of collaborations between academic research institutes and players in the bioinformatics market, and growing number of government funding programs for genomics research. 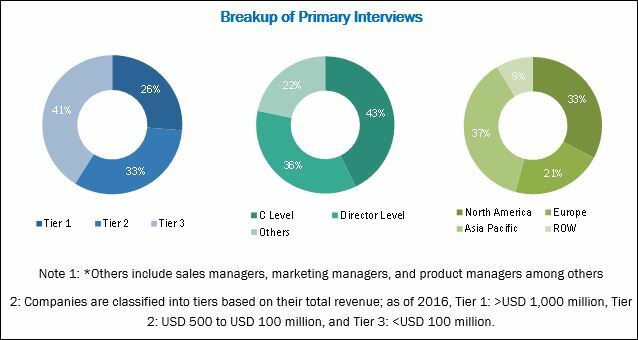 This report covers the bioinformatics services market data across four major geographies, namely, North America, Europe, Asia Pacific, and the Rest of the World (RoW). North America accounted for the largest share of the global market in 2017, followed by Europe. The large share of the North American region is mainly attributed to the presence of leading bioinformatics service providers in the region, decreasing cost of sequencing, increasing number of genomic research activities in the region, high incidence of target diseases (such as cancer and genetic diseases), and favorable funding scenario for bioinformatics-based research. The Asia Pacific market is projected to grow at the highest CAGR during the forecast period. The increasing incidence of genetic diseases, rising number of bioinformatics-based research studies, and growing demand for bioinformatics services from various end users are the major factors driving the growth of the bioinformatics services market in the Asia Pacific. The in-house development of bioinformatics solutions and publically available bioinformatics tools are expected to restrain the growth of the bioinformatics services market in the forecast period. As of 2017, Illumina (US) dominated the global bioinformatics services market through its broad product portfolio, strong geographical presence, and wide customer base across the globe. To maintain its leadership position in the market, the company has been focusing on technological advancements in the field of bioinformatics. Thermo Fisher Scientific (US) held the second leadership position in the global market. Other prominent players in the global bioinformatics services market included Eurofins Scientific (Luxembourg), BGI (China), NeoGenomics (US), PerkinElmer (US), CD Genomics (US), Macrogen (South Korea), QIAGEN (Germany), GENEWIZ (US), Source BioScience (UK), Microsynth (Switzerland), MedGenome (India), Fios Genomics (UK), and BaseClear (Netherlands), among others.